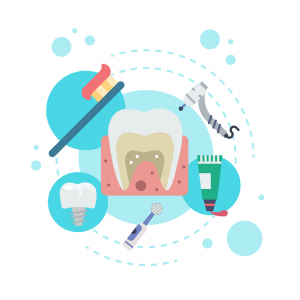 If you feel like tending to your oral health takes too much time out of your day, just think about how much time it takes to get a cavity filled, or worse, have a tooth extracted or get a root canal. The fact is taking care of your teeth doesn’t need to take more than a few minutes out of your day. Brushing your teeth twice a day is important to remove food debris and bacteria and to prevent plaque from building up and eroding the tooth enamel. Brushing only needs to be done for two minutes at a time but it’s not quite as simple as squirting a little toothpaste on your brush and scrubbing away. Start with a good toothbrush. Choose a toothbrush with soft bristles to avoid damaging teeth and gums and a small head and a flexible neck to make it easier to reach all of your teeth. You should replace your toothbrush every three months. Starting with your back teeth, hold your toothbrush at a 45 degree angle to your gum line. Brush gently in a circular motion to avoid damage to your gums and tooth enamel. Don’t forget the inner and outer surfaces of each tooth, as well as the chewing surface. Pay special attention to the inner surface of the front teeth, as these surfaces are often missed. While you’re at it take a few seconds to give your tongue a good brushing. This will help remove bacteria from your mouth and keep your breath fresh. When you finish spit out the toothpaste and don’t worry about rinsing. That’s all there is to it. Brushing is important but it can’t get the area between your teeth clean. To clean this hard to reach area you need to floss. Like brushing, flossing doesn’t need to take more than a couple of minutes a day and can help prevent cavities and gum disease and keep your breath fresh. Pick a time that suits you. In the morning is good if you find yourself tired at the end of the day. Evening is good if you like the feeling of going to bed with a clean mouth. Either way pick a time and stick with it to make it easier to remember. Take about 45cm of floss and wrap it around your middle fingers, holding it between your thumbs and forefingers. Gently slide the floss between your teeth, taking care not to damage your gums. Gently slide the floss under the gums to clean the area where the tooth meets the gums. Use a side to side motion to ensure the surfaces of each tooth are thoroughly cleaned. If you have trouble reaching into your mouth to floss thoroughly, consider a floss pick a bit of floss strung between prongs with a handle. You have to eat anyway so this aspect of oral health doesn’t need to take any extra time. There are several things you can do to make sure your diet isn’t causing you problems. Most beverages contain sugars or are acidic, both of which can damage your tooth enamel. In addition, water can help rinse food particles off your teeth between brushing. Frequent snacking means your teeth are under constant attack by acids in your food. Limiting snacks can help give your saliva a chance to protect your teeth by reducing acidity in your mouth. As we will be celebrating Dental Health Week next week, we would like to inform you that it is important that you visit your dentist twice a year. To learn more about effective brushing and flossing and how diet affects your teeth, call Westside Dentistry on 07 3278 0580 now to arrange an appointment.